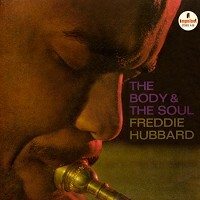 The second of trumpeter Freddie Hubbard's two Impulse albums features the 25-year old in three separate settings. He is heard along with a tenor-saxophonist backed by strings ("Skylark," "I Got It Bad" and "Chocolate Shake" are all given beautiful treatments), with a 16-piece band and in a septet with Eric Dolphy and Wayne Shorter. This well-rounded and highly recommended showcase shows why Freddie Hubbard was considered the top trumpeter to emerge during the early '60s.